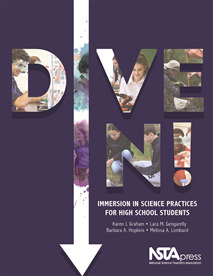 •	Detailed vignettes offer authentic perspectives about conducting student investigations and integrating science practices that support the NGSS. •	Field-tested learning activities accompany many of the vignettes and illustrate a range of investigations you can adopt or adapt, regardless of your grade level or science content focus. •	A science practice integration (SPI) toolkit will be useful whether you’re already swimming in SPI instruction or just want to dip a toe in. You will learn how to modify existing lesson plans to immerse your students in more science practices. If you need help with SPI’s challenges, you can turn to a handy trouble-shooting guide that outlines concerns and offers potential solutions. Written from an authentic teacher perspective, Dive In! presents a realistic picture of the successes and challenges of integrating NGSS science practices into your classroom. This book is the resource you need to help students shift from only knowing about science to actually investigating and making sense of it. Jump in with both feet!